This project developed specifications for remote airfield lighting systems that optimize performance, minimize cost, are visually effective and reliable, use minimal energy, are easy to implement, and require low maintenance. 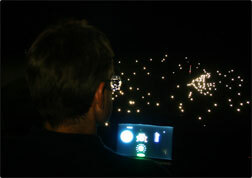 Researchers simulated visual conditions of airfield lighting by using a scale model capable of varying the LED intensity, color, flash pattern, viewing angle, and spatial arrangement of simulated airfield lights. Subjects viewed different lighting scenarios and were asked to locate the airfield and determine the runway’s orientation. Researchers measured the subjects’ elapsed time, accuracy rate, and confidence level in locating the appropriate airfield. Airfield lighting should be visible to both peripheral and foveal (central) vision: “Locate and identify” task involves both peripheral detection and foveal examination; Airfield lights should not disappear when looked at directly. A system for mesopic photometry, developed earlier by the LRC, works well for specifying the spectrum of airfield lighting. Detection of airfield lighting is best described by a purely scotopic spectral sensitivity. When airfield orientation and visual confirmation are required, the fitted spectral response requires some photopic contribution. A pilot’s confidence rating for identifying the airport follows a similar trend, but with slightly more photopic contribution. Additional edge lights, located between the four corner lights, contribute little to identifying and orienting to the runway. If used, edge lights should be as bright as corner lights. Study subject viewing scale model simulation of remote airfield and surrounding community at night. Prototype airfield fixtures developed by the LRC were used in flight tests in Alaska and North Dakota to validate laboratory results. 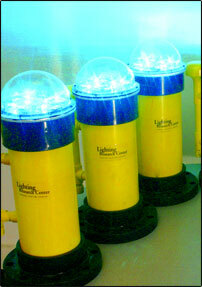 Placed at the corners of a runway, these fixtures helped to confirm the optimum spectrum, intensity, flash rate, and distribution for airfield lighting. 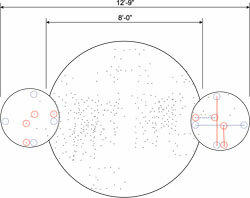 Diagram of scale model used to simulate remote airfield lighting at night.